If only we could count on scientists to figure out time travel one of these days. Just imagine all the mistakes we will be able to go back and correct in the future. In the meantime, though, you’ll need to rely on the wisdom of others to help prevent you from making mistakes in the first place. Most of us wish we had had someone to hold our hand through our first years on the job. A lucky few were blessed with mentors and patient supervisors who guided us in our journey, but most of us had to feel our way along in the dark, tripping over misplaced office supplies and bumping into open file drawers until we could finally stumble across the light switch and figure out how best to manage our careers. We gained a wealth of experience the hard way, but we would much prefer to share our knowledge with those coming behind us and give them an easier path to follow. 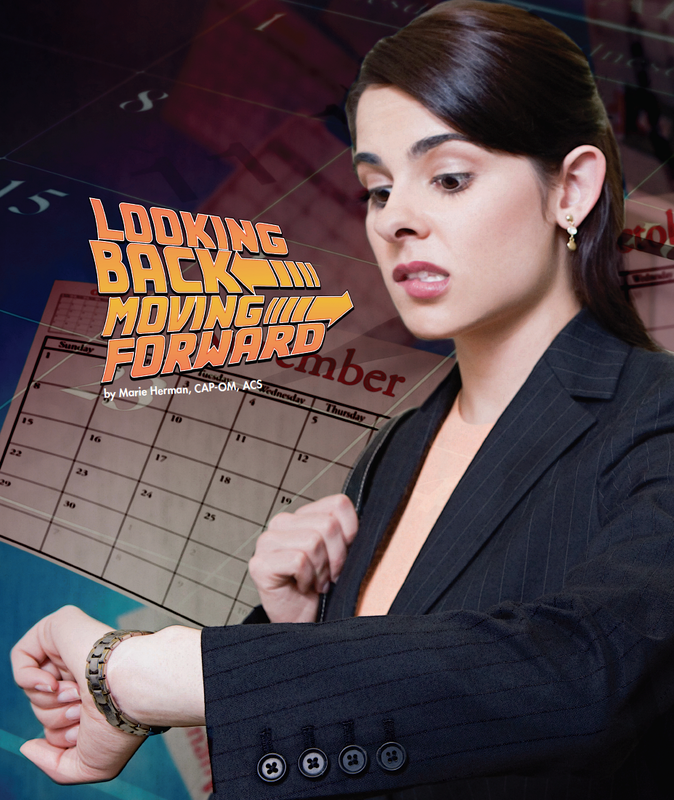 Several experienced administrative professionals shared their insights on what they would do differently if they could go back in time and relive the early days of their careers. These individuals touched upon many different themes, and here are a few of the highlights. Stephanie Eastman, senior executive assistant at Baxter, wishes she had slowed down and been more thorough in the moment. “All too often, we are rushing from project to project, as administrative professionals, essentially playing ‘Whack a Mole’ to keep up with the latest fire. It’s important to take the time to perform maintenance to complete a project completely.” This would have saved a lot of time for Stephanie when she had to go back and revisit previous projects. It’s easy to let those debriefing tasks slide—to not capture notes on the event for the next year, to not go back and update the file index, etc. But a few minutes spent at the close of projects or at regular intervals can save many hours of time in the future. Education and lifelong learning featured heavily in the thoughts of these administrative professionals. Patti Hansen, CAP-OM, executive assistant at Comp-TIA, adds, “Keep learning. Keep getting educated. Try it even if you are not sure you’ll like it. Knowledge is power and no one can take it away from you.” In addition to enhancing your own career opportunities, by pursuing lifelong learning, you’ll be setting an example for your children and grandchildren to see that learning doesn’t stop when you graduate. While the need to pursue lifelong education was a theme of many of the administrative professionals interviewed, there were also suggestions to help newer employees hit the ground running faster. Taking the time to learn as much as you can about your position, your company, and your industry will make you a better informed employee who is able to see the big picture. This will make your company take your opinions and views more seriously. Finally, several of the administrative professionals would have reminded themselves how important it is to take care of yourself along the line. All too often, we spend our time taking care of our executive and our coworkers (as well as our family and friends) and we put ourselves last on the list. Setting aside time to recharge your batteries and regain your energy and perspective will pay off in many ways, leading to improved relationships with your coworkers and family, as well as delay of burnout and increase in motivation to complete challenging tasks. You’ll be better able to let daily annoyances roll off your back and you’ll be more even keeled emotionally. By following the guidance of these experienced administrative professionals who have “been there, done that,” you’ll leapfrog ahead of your less experienced colleagues. Unless time travel becomes a reality, following these hard-learned suggestions will expose you to a career of opportunities and satisfaction. Marie Herman operates MRH Enterprises, whose services include teaching computer and cooking classes live and via the internet, writing articles, and conducting workshops and other speaking engagements. She can be reached at iaap@mrhenterprises.com. Just an admin… or not.